Welcome to San Francisco — or, at least, one version of that city, where humans and fae and dragons all live in (relative) peace. Roku MacCormick is the half-human, half-fae detective assigned to the Chinatown precinct, nicknamed Dim Sum Asylum. An average day for him involves everything from runaway shrine idols to berserk dragons to … well … you name it, and he’s probably dealt with it. Not so his brand new partner, Trent Leonard. Retired military (or so he says). Ordinary human (or so he seems). But Roku and Trent both have secrets. And if they are going to learn to trust one another, and stop the mad sorcerer who is killing his way through Chinatown, they’re going to have to give up those secrets … before these magical murders bring San Francisco down in flames …. I first encountered Rhys Ford in the pages of Charmed and Dangerous, a collection of M/M paranormal romance novellas and short stories. I absolutely loved her contribution, “Dim Sum Asylum,” and hoped that she would either expand on that story or publish more set in the same universe. Happily, she heard my prayers. 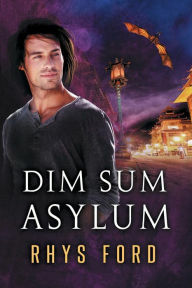 The novel Dim Sum Asylum takes that original novella, adds another level of mystery, tosses in a dozen new characters, and delves more deeply into the background of Roku and Trent. And also ups the heat level. Ford is rapidly becoming one of my favorite authors. Her characters are emotionally and psychologically complex, her mysteries are compelling, and her world-building is ridiculously detailed. Dim Sum Asylum is no exception. So many scenes take place at or near restaurants and all that delicious food that I actually got hungry reading the book. Dim Sum Asylum is also a treat from a Pagan or polytheist’s point of view. This San Francisco — this entire fictional world — is colorfully, chaotically polytheistic. Roku is the child of an Irish fae mother and a human Japanese father; yet when he prays it is to Pele and Kuan Yin. At several points in the story, Trent swears by “Jesus and Odin’s birds” and by “Pele and Morrígan.” Shrines to various Gods and ancestors litter Chinatown, where the people practice their traditional rites without fear of oppression or ridicule. As a polytheist, losing myself in the pages of Dim Sum Asylum was a delight. I didn’t want to come out. Hopefully, more adventures featuring Roku and Trent lie in the future — but not too far. Highly recommended to fans of Ford’s Kai Gracen series, as well as KJ Charles, Jordan L Hawk, Jolene Dawe, Megan Derr, Ginn Hale, and Astrid Amara.